The AIBC Annual Conference Professional Development Committee is still seeking new members. The committee will concern itself with planning, strategizing and coordinating the professional development program for the 2015 AIBC Annual Conference. Tasks include planning professional development streams; identifying and confirming potential session presenters; and providing session information for conference promotional material. This committee typically meets every first and third Thursday from January to June. Meetings take place from 12:00 noon to 2:00 p.m. at the AIBC offices. If you are interested in volunteering on this committee, please contact Professional Services Coordinator Alexandra Kokol by email (akokol@aibc.ca). The role of an advisory design panel member is to give impartial, professional advice directly on any proposal or policy affecting the community’s physical environment in the public interest. Please fill out an interactive application form and forward your submissions to the attention of Professional Services Coordinator Alexandra Kokol by email (akokol@aibc.ca). AIBC architects and retired architects were invited to participate in a survey designed to provide the institute with feedback on the Retired Architect AIBC associate category. The survey ran from November 21 to December 5. Thank you to those who took the time to complete the short, seven-question survey. More than 18% of architects and an impressive 63% of retired architects participated. A special shout out to Retired Architects AIBC for their contributions. The winners of the survey random prize ($25 Starbucks card) will be notified shortly. The survey results will be available for viewing in the new year. A report, including recommended next steps, will also be presented to council in early 2015. We invite all survey participants, and those interested in the topic to continue to follow the development of this council initiative. Public-private partnerships have cost Ontario taxpayers nearly $8-billion more on infrastructure over the past nine years than if the government had successfully built the projects itself. The revelation, from Auditor-General Bonnie Lysyk, comes as Premier Kathleen Wynne stakes the province’s future on a vast construction program that will see dozens of new schools, bridges and subways built over the next decade. And it suggests Ms. Wynne can build that infrastructure more cheaply as she wrestles down a $12.5-billion deficit. “If the public sector could manage projects successfully, on time and on budget, there is taxpayer money to be saved,” Ms. Lysyk said Tuesday at Queen’s Park. 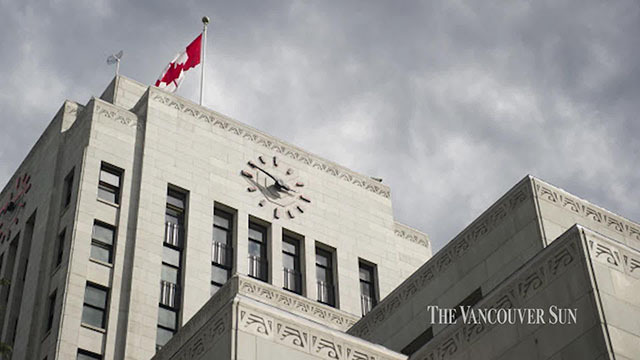 VANCOUVER – Carli Edwards, whose job was to uphold Vancouver’s building bylaw, has resigned after doing minor renovations on her home without a building permit, City Manager Penny Ballem said Thursday. Edwards, who had been Vancouver’s deputy chief building official for nearly three years, voluntarily resigned from her $137,676-a-year job and was given six months’ severance after she co-operated with an investigation that started with the complaint of an internal whistleblower. Ballem said Edwards had done a small renovation to her principal residence, but failed to obtain the proper permits. As the official with statutory power over the bylaw and building inspection department, the transgression was serious even though the value of the work was minor, Ballem said. Join the team of consultants who designed the recent expansion of the Vancouver Aquarium for an exclusive tour. Understand the concept behind the recent revitalization of the Vancouver Aquarium from an architectural, lighting, and landscape design perspective and learn about the latest technologies used in materials not only for lighting but also for interactive media installations. The tour will be followed by a cocktail reception in the Arctic Gallery. Date: Thursday, January 22, 2015, 5:30-8:00pm. Location: Vancouver Aquarium, 845 Avison Way, Vancouver, B.C. Cost: Member – $50, Non-members – $60. Members of affiliated associations are eligible for membership pricing – please contact registration@iesbc.org for details. To register: You may register by purchasing tickets on-line. The Illuminating Engineering Society of North America, Vancouver, British Columbia (IESBC) is the British Columbia Section of the Illuminating Engineering Society of North America (IESNA). The IESBC’s vision is to create a premier lighting community that’s dedicated to promoting the art and science of lighting to its members, allied profession organizations and to the public through inspiring events and through informative programs, presentations and networking events. To learn more about all AIBC Registered Educational Providers, please visit the AIBC website. On April 1, 2014, Vancouver City Council adopted the 2012 British Columbia Building Code (BCBC) with additional requirements and revisions specific to Vancouver, which takes effect January 1, 2015. Developed in consultation with industry professionals, the new 2014 Building Bylaw 10908 includes amendments to the current Building Bylaw 9419 to improve housing for seniors and people with disabilities, while supporting the objectives of the Greenest City 2020 Action Plan. The complete 2014 Building Bylaw will soon be available through the Queen’s Printer. Revised Soil Gas Control provisions in 9.13.4. Updated referenced standards, architects may need to update many specification sections. Many new, useful appendix notes which do not change the code requirements but assist in clarifying the meaning of various code requirements. Replacement pages for those using printed versions of the code will be available soon at the British Columbia Codes web page. In the meantime, the Ministerial Orders detailing the changes can be found at this site. Online code users will see the changes as of the implementation date. On December 8, 2014 the Canadian Architectural Licensing Authorities (CALA) in conjunction with the National Council of Architectural Registration Boards (NCARB) in the USA and the Federacion de Colegios de Arquitectos de la Republica Mexicana (FCARM) in Mexico, released a joint statement announcing a major agreement to mutually recognize architect credentials in the three countries, making it possible for architects to work across all North American borders. The agreement, the ‘Tri-National Mutual Recognition Agreement for the International Practice of Architecture among Canada, the United States and Mexico’, informally known as the ‘Tri-National Agreement’, represents over a decade of negotiations, bringing cross-border recognition of professional credentials from concept to reality in the spirit of the North American Free Trade Agreement (NAFTA). Qualified architects, from each country, who satisfy the requirements of the agreement, will be granted a credential that will lead to a licence to practice architecture in the host country. For further information, please review the full statement or visit the website of the Ontario Association of Architects. 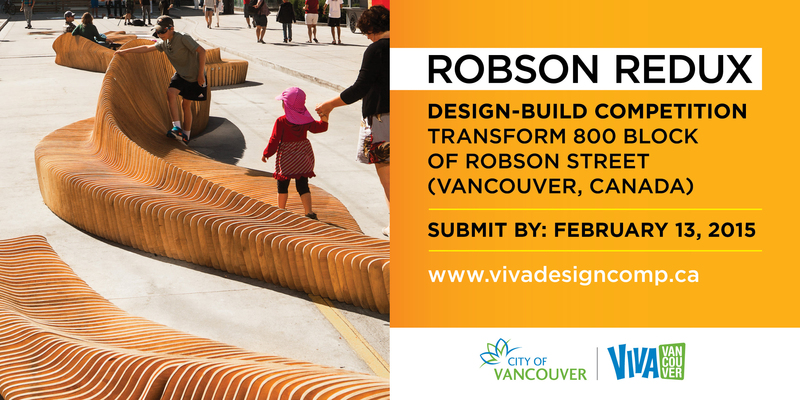 VIVA Vancouver will open its 800 Robson Street space to the creative community once again with Robson Redux, a design-build competition that invites emerging and professional designers and artists to submit their design ideas related to the theme of “connection”. The winner will make their design a reality, building and installing it for the 2015 summer season as a public space for people to enjoy. VIVA Vancouver’s Robson Redux design-build competition temporarily transforms the 800 block of Robson Street into a summertime pedestrian plaza. This block is located in the heart of downtown Vancouver, Canada. Installation will take place in early summer, open on Canada Day (July 1, 2015) and remain in place until the end of Labour Day long weekend (September 7, 2015). The winning design will be selected by a jury composed of Marc Boutin (Principal, Marc Boutin Architectural Collaborative and Associate Professor, University of Calgary), Barbara Cole (Principal of Cole Projects, Executive Director of Other Sights for Artists’ Projects Association), Jane Durante (Founding Principal, Durante Kreuk Landscape Architects), Stanley King (Founder and Head of Co-Design Group), Matthew Soules (Director, Matthew Soules Architecture and Assistant Professor, School of Architecture and Landscape Architecture, University of British Columbia). The winning team will be provided a small design honorarium and up to $40,000 to cover costs of materials, fabrication, construction, installation and de-installation for their projects. Anyone may enter this competition, however, criteria and submission requirements lend themselves to expertise in architecture, landscape architecture, urban design, industrial design, contemporary art and other related fields. The competition encourages design teams with diverse skill sets to submit joint entries. Teams can submit their designs ideas online at http://www.vivadesigncomp.ca for a small fee. Deadline to register is January 30, 2015; submission deadline is February 13, 2015. VIVA Vancouver is a public space program that specializes in turning road spaces into people places. Working with various community partners, the program re-purposes road space to create temporary or semi-permanent public spaces. The Architectural Institute of British Columbia (AIBC), on behalf of the Canadian Architectural Licensing Authorities (CALA), is pleased to announce that there are now 40 US states signed onto the new Mutual Recognition Agreement (MRA) between CALA and the National Council of Architectural Registration Boards (NCARB). The MRA, for the reciprocal registration of architects between the USA and Canada, came into effect January 1, 2014. To be eligible, an architect must be a citizen or lawful permanent resident of the United States or Canada, and their principal place of practice must be in a jurisdiction that is a current signatory of the MRA to seek registration/licensure in the other country. Their registration/license must be in ‘good standing’ and they must have completed at least 2,000 hours (approximately one year of full-time employment) of post-registration/licensure experience practicing in their home country. Architects that were originally licensed in Canada or the USA through a foreign reciprocal registration agreement, including the Broadly Experienced Foreign Architect (BEFA) Program, will not be eligible under this agreement. Those registered/licensed to practice architecture in one or more Canadian jurisdictions will require NCARB certification to avail themselves of the agreement. Further information can be found in section 3 of NCARB’s Certification Guidelines. At this time, all 11 Canadian jurisdictions and 40 US states are signed onto the MRA. The remaining US jurisdictions are continuing to consider implementation and the list of signatories will be updated accordingly. For more information and the current list of signatories, please visit the AIBC website. AIBC’s Engagement 2.0 initiative came to a close on December 5 and participation levels were an overwhelming success! Members, associates, volunteers and staff participated through the 12 week process. Participant’s input will help shape where the AIBC goes next on such important subjects as Advocacy, Act Review and the Intern Architect Program. Next steps for Engagement 2.0 will be the production of a report by the consultant SB Communications & Public Affairs Ltd. AIBC Council will review the report in early 2015 to determine next steps, including how to report out to the membership on the findings. Learn more about stakeholder engagement. At the May 2014 annual meeting, members approved bylaws to allow the institute to conduct bylaw amendment and council election votes electronically. At its November 2014 meeting, AIBC Council gave support to having three bylaw amendments advance to member consultation in anticipation of an e-vote in the spring of 2015. The Bylaw Review Committee recommended three “administrative” bylaw amendments for the purposes of this initial electronic vote. Addition of a bylaw that designates the AIBC’s executive director as the “head” of the institute for freedom of information (FOI) legislation purposes. The AIBC is what is known as a “local public body” under BC FOI laws. More information about the history of the e-voting initiative can be found on the AIBC web site. While the AIBC is not currently planning an electronic vote for council elections in 2015, an e-vote is proposed for the 2016 council election. The institute will be providing ongoing information via eNews and the web site as well as interactive member consultation opportunities with respect to these proposed bylaw changes. At any time, feedback can be provided to the Bylaw Review Committee on this issue using the bylawfeedback@aibc.ca address. AIBC Council will be reviewing rules for the process of e-voting later this month. In keeping with council policy, members will be notified and given an opportunity to provide feedback before such rules come into effect. AIBC 2015 annual fee invoices will be emailed to all members, associates, firms, licensees and affiliates tomorrow. Please follow the instructions on the invoice for payment options. Please note that payment online is our preferred option. The deadline for payment is February 1, 2015. If you do not receive the email by Monday, please check your spam folders or simply login online to your AIBC account via the AIBC’s web site to access your invoice and pay your fee. AIBC Council has determined that there are no changes in the annual fees for 2015 for members, associates, affiliates and certificates of practice. Fees have increased by 5% for temporary licences (licensees). Information regarding applicable fees and payment requirements can be found in Bulletin 01 (2015): Fees, Fines and Charges. AIBC Architectural Awards and JurySubmission Deadline: Less Than One Week Left! 2016 AIBC Architectural Awards & Awards Jury – Less Than Two Weeks Left!